Let me tell you about two trips from my home, in Minneapolis, just three blocks from the St. Paul city line. The first was with my kids to use the Desnoyer Park Playground, which is (sadly) nicer than any walkable playground nearby in Minneapolis. The kids ask for it by name. Google Maps places it 1.1 miles away by walking. Normally we drive (it might be a stop on part of a longer shopping trip, and is a good place for the kids to get their “yahs” out), but on one of the few pleasant weekend days of 2013, we walked. We used this route (shown below). It was filled with broken glass, uneven railroad tracks, and lack of sidewalks. It’s somewhat industrial, so its lack of aesthetics was not surprising, but it is hard to see the nature of the unwalkability from the car. The walk will not be repeated. The reason for using this path is that the next shortest alternative crossed the Mn280 on and off-ramps, which were highly undesirable to walk on (see next paragraph). We walked back via East River Parkway, but the distance (1.3 miles) while seemingly not much different, is both 0.5 miles longer round trip, more complex, and hillier. Even East River Parkway does not have sidewalks on both sides of the road, though the grassy strip is ok in the late spring. Ideally there would be a pedestrian crossing of I-94 at Emerald or Bedford to St. Anthony Avenue, but I suspect pedestrian demand is too low to warrant such a crossing (certainly it would not be anyone’s highest priority). The second was from my house to the Jimmy Johns subshop at University/Franklin and Pelham (0.6 miles). I took this route (2nd map). Believe it or not, the sidewalks on Franklin Avenue are not complete (photo via Google Street View). Just east of Curfew Street, you are forced into the street before you can walk on a grassy strip where a sidewalk should be. (This is across Franklin from the Court International building) I could have crossed Franklin Avenue (twice) to complete the trip on sidewalks, but that seemed stupid. There is also a really terrible pedestrian interface at the Mn280 Interchange, but at least it has crossing signals and sidewalks. I don’t have an accurate map of all the sidewalks in the metro area (if anyone does, please share), but clearly the network is less complete than the automobile street network. One could look on the bright side, and say this just means the city is trying to implement shared spaces, just unevenly, but that implies a progressive intentionality that I think we know is lacking. My conclusion from this is that (1) St. Paul hates(PC edit) is strongly indifferent to the bipedal mobility needs of the residents of Minneapolis and does not want any inter-municipal pedestrian travel, and/or (2) St. Paul doesn’t much like pedestrians. The problem definitely isn’t unique to that part of St. Paul. I live on the east side, and there are a lot of streets without sidewalks here. (In our neighborhood it’s mostly the north-south streets, for some reason.) Naturally, you see a lot of pedestrians just walking right in the street — including me, on occasion. I’ve only been to St. Paul once, but based on that experience I find it entirely plausible that St. Paul does not realize that Minneapolis exists and is by far the more desirable destination. I think you’re hitting on something interesting, the ‘border zone’ between the two cities, often left in infrastructural limbo. I’d like to see mandatory sidewalk retrofit everywhere in the city, particularly in places near transit investments. I say “nice plan,” but I should say, “bare minimum but much better than nothing” plan. The missing section on Franklin actually abutted residential property (though the section in front of Weyerhauser is not exactly a conventional sidewalk, it was a paved section separated from traffic). The biggest problem for sidewalks in many cities is the assessment system. I live in a small town around a small city. Just this year, the city decided to change its entire sidewalk payment system, to treat sidewalks as a public amenity and charge everyone in the city for the “sidewalk fund”, rather than just charging the property owner who has the sidewalk next to them. You know, pay for sidewalks the way roads are paid for. There is a transition credit scheme for property owners who had sidewalk assessments recently. The town I’m in has been doing it that way for a decade: sidewalks are just part of the town’s inventory of assets and are paid for out of the road fund (since they are public roadways, albeit not open to motor vehicles). Change the funding system, and you’ll find local property owners much more willing to accept sidewalks. That is most certainly not the way (most) cities pay for roads. Most — including Minneapolis — charge property owners a substantial assessment. Some (first example that comes to mind is Baxter) charge property owners 100% of roadway costs. That’s not to say that’s a good system, but I think it’s important to acknowledge that special assessments are used for roadway costs, too. There’s a much more positive way to look at special assessments for sidewalks, though: sidewalks are an amenity, not something utilitarian like a stormsewer. Like the boulevard plantings, they add value to the home and are the responsibility of the homeowner to maintain. The only situation in which I think sidewalk construction should be the responsibility of the city is when they’re being installed new on an existing street that did not have them before. In this case, the sidewalks have not proven themselves for the homeowners; avoiding extreme resistance from homeowners is worth the cost. I lived at Sharon and Emarald for a time, right on the border of the two cities, so I’m quite familiar with the walk between there and the Dubliner through the industrial wasteland. On the south side of Franklin, and elsewhere in our cities, I’ve always wondered how we could do some sort of space demarcation that looks nicer than plastic bollards but creates a segregated non-car space within the existing curb without affecting drainage. Maybe planter boxes or something? Regarding Wabash Ave between Emerald and Perham- That was a secret route and you just broke the code by discussing it. I think you hit the nail on the head about this being a bordering cities problem, neither wants to pay near city lines. It may be a bordering cities problem, but the lack of amenity is all on the St. Paul side of the border. Minneapolis has sidewalks (not the world’s best sidewalks, but sidewalks, which are getting repaired this summer thanks to a special assessment). St. Paul is hit or miss. Please take a look at Cecil St. SE near the Shriners Hospital campus. There’s a gap there that could use a ped./bike bridge and trail on both sides of the freeway. And it’s all in the city of Minneapolis. The SE end of the trail would be close to St. Paul. Funding could come from a mixture of sources : land from Shriners Hospital and Can.Pac.Rwy. and dollars from Uncle Sam, MNDOT, the city of Minneapolis, and Can.Pac.Rwy. The benefit to the Can.Pac.Rwy would be the use of the overpasses to mount sensors and signals for their trains. I’ve always commented on how the Mississippi River trail happens near the Shriner’s Hospital. 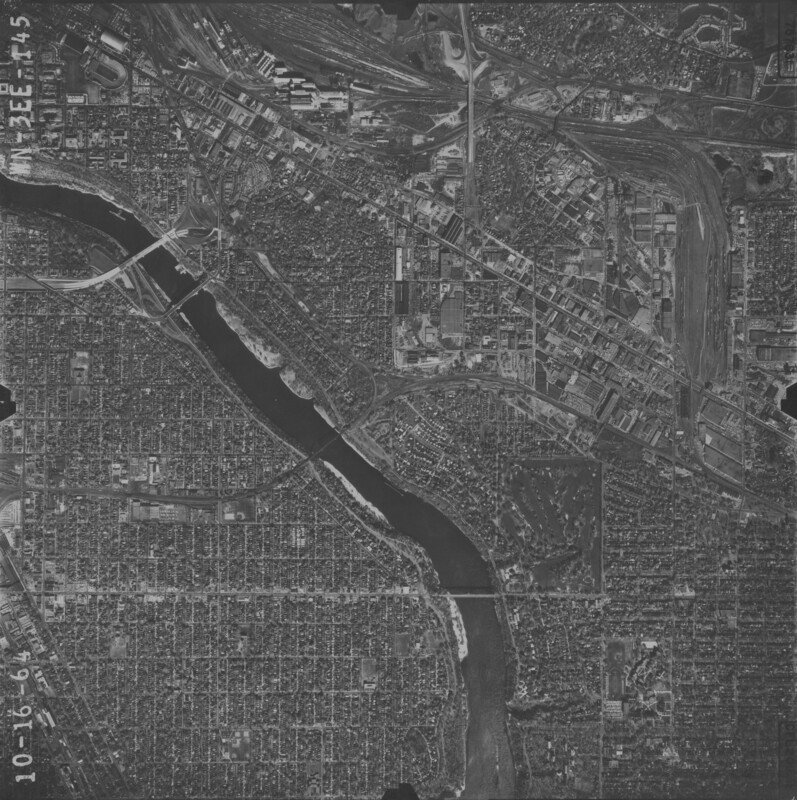 You can tell when you cross into St. Paul because BOOM it goes double-wide and has fewer potholes. I walk to work in Saint Paul with no problem. I use a mix of sidewalks and non moterized transportation trails. I think painting Saint Paul as anti pedestrian because you have trouble crossing two freeways and an industrial area on your way to the nearest playground (from your home in Minneapolis) is weak. Your walk would be made much better if the paries that be get serious about the Midtown greenway expansion. There is always room for improvement. Things will also improve as the industrial area your house and the amenities you desire in Saint Paul becomes more residential. Did you look at the long-term plan for this neighborhood, this area will look a lot different. I also agree with Darren that your title is misleading and plays into a twisted Minneapolis-centric narrative. Forget bike lanes they have ped lanes. (45 MPH wide road ) Ironcially enough named Wall ave. If your home was in an island where there was no access to a park with out crossing major highways or rail crossings, I would empathize with the premise of the article. However, I think you may have been fishing for a story here and playing all of us just a bit. I have kids and have done my share of trips to parks they like and parks that are close to home. If you live in an area long enough, you know what park is doable by car and what park is doable by walking. Can you explain why you knew of alternatives and yet complained about the route taken? How is there St Paul indifference to you when you walked thru an industrial area you knew about? This is not the way to go about revising urban planning. I think Tommy Mischke would scold your efforts here too! Is there any difference with your journey to the park than my desire to cycle to work on the highway because that is a closer route to my office? Both are rather silly propositions. I have received a number of useful suggestions. Let me do some further explaining. 0. If places are within 1 mile from each other, the general normative rule I have is that they should be walkable. Ideally one takes the shortest network path. What constitutes that path depends on the facilities in place. 1. I think going to playgrounds via walking is a reasonable thing to do if possible. Most people in the streets.mn community would endorse walkability as a normative goal. Walkability is enhanced by actually walking. 2. That it is an industrial area is no excuse for no sidewalks in a city. I don’t know why anyone assumes that no one might walk to work (or for lunch) in an industrial area. Or that people who work in such areas don’t deserve sidewalks. It’s hardly low density or rural. Given the industry is only two blocks wide with non-industrial stuff on either end and the middle further supports the points. If it has curb and gutter it should have sidewalks. 3. I try to teach the children NOT to walk on railroad track (or in the street), to avoid death and injury. Thus the railroad path which would be shorter is a non-starter until some clearly demarcated (and maybe paved) trail is instituted. As far as I know it is currently railroad right-of-way and thus private property. 4. These examples illustrate cases (which happen to be in St. Paul, which happen to be near the border with Minneapolis, which happens to be near where I live, which happens to be the places I am likely to walk or want to walk and therefore notice) which are not “walkable” and I think should be. 5. In my view, fixing the pedestrian network on existing roads is easy compared to building new links. Sidewalks are cheaper than pedestrian bridges by a factor of 100 or so. On Franklin Avenue, the missing sidewalk is less than 1 block long (along with another block of side path). The rest of the path is not pleasant (nor I suspect safe) due to the Franklin Ave/Mn 280 interchanges, but at some point those will come up for reconstruction, and something better can be done. 6. Future plans are great, I would love to see more pedestrian crossings of the highways and railroad tracks, or the extension of the Midtown Greenway trail. By the time they are built however, my kids will likely be uninterested in playgrounds, and likely complaining about the difficulty of biking to the nearest brewpub, hence the focus on actual conditions. 7. “Nobody walks to St. Paul” is a play on the Missing Persons’ song “Nobody walks in LA” (notice the preposition shift). It is obviously self-negating in the post, as I illustrated 2 walks to St. Paul, but tried to illustrate that the walks were sub-par, and thus fewer in number than a simple examination of the availability of origins and destinations would suggest likely. This is a planning issue in that everything is a planning issue. But in reality this is an operations issue, about how we (or in this case, they, St. Paul) choose to implement roads, why we build roads for cars and not people, and how we allow things that are close together to remain disconnected, (or in some other cases disconnect things that used to be cohesive). You can walk to 2 parks in your neighborhood. Your kids wanted to go to another park. There are sidewalks missing on the way to the other park. You took the route with missing sidewalks. Still unclear why you chose the route you took.. The sidewalks were more missing on the ground than they look from the car. I.e. it looks like there is a sidepath from the car. The sidepath is in sorry shape such as it is, which is quite visible at 3 MPH and not visible at 20 MPH. The lack of proper connections between municipalities seems to be a very common issue. Check out Portland Avenue at the Crosstown Hwy. Portland has sidewalks on both sides through all of Minneapolis, Richfield, and Bloomington. Except right here, where one side disappears for a short block. This is a problem. St. Paul ought to prioritize getting the gaps in Franklin addressed. I’m not sure without more research what the specific hold-ups have been – financial, ownership, or simply the need for momentum. But this is to say, it’s a problem. Indulge me for a moment as I try to marry your aspirations to a small dosing of real-world pragmatism. The areas around the secondary streets you mention were rezoned from industrial to mixed use, middle density zoning two years ago, in anticipation of Central Corridor. Given market realities, those particular industrial uses likely to change substantially in the next decade or so. So in a world of necessarily limited resources, I think there’s a fair question in this specific instance about whether your lightly-trafficed Emerald/Wabash Street route should be a priority for investment, if the street grid is likely to be totally rebuilt (and likely somewhat modified and expanded) in that area in just a few years. I think your post surfaces a larger distinction, surely familiar to you: infrastructure change takes a long time, because it takes a great deal of money. Judging a city’s infrastructure by simply looking at what exists on the ground at any given moment gives a sense of the collected history of past priorities. In this regard, I know all too well St. Paul has a few misses and plenty of strengths, but since I grew up west of the river, I know perfectly well Minneapolis does as well. If you’re trying to assess a city’s commitment to pedestrians (or multi-modalism in general), simply looking at what’s on the ground is a rather limiting metric in the short term. It’s probably at least as instructive, and probably more constructive, to look at the level of investment and consideration given to pedestrian infrastructure right now, as a matter of current policy. To that end, as Bill mentioned, there’s a concerted, funded effort in the Midway Industrial area just to the east to retrofit sidewalks to pretty much every block of street in the area in the next few years. Just to the south, the City forced the exclusive Town & Country Golf Club to (at long last) pay for a sidewalk along their side of Marshall Avenue. After they got done suing the City. In a larger sense, I think there’s a couple strands that I don’t want to get lost in the volley. First, the area you’re concerned about (along with Town & Country) is represented by Councilmember Russ Stark – as pro-pedestrian as any in the state – further evidence that you should judge not simply what is on the ground, but continuing changes in underlying policy. Second, since 2010, the City has established a Transportation Committee that answers to the Planning Commission to engage in some of the institutional-level changes needed to ensure St. Paul becomes a more multi-modal destination. Finally, issues of walkability are continuing to be highlighted by community members, such as in the recent study of walkability in the Central Corridor by the District Councils Collaborative (http://bit.ly/15EztcB). That work might be a good topic for future streets.mn posts. In any case, sidewalk gaps like this are real problem that deserve real solutions. Just as a clarification – a sidewalk was installed along Marshall Ave. by Town & Country Golf Course. A quick check back reminded me the outcome of the lawsuit over the project was that Town & Country did not have to pay for the sidewalk. The lawsuit is a reminder in any case that these issues are seldom very easy, given our current approach to sidewalks particularly. Which does bring up the question, raised in part by the aforementioned work the District Councils Collaborative undertook: why do cities pay for streets, but usually share the costs of sidewalks? That underlying contradiction would seem to be a root cause of Mr. Levinson’s displeasure. Yep. Sidewalks are part of streets and should be fully paid for, maintained, and controlled in the same way as the streets. 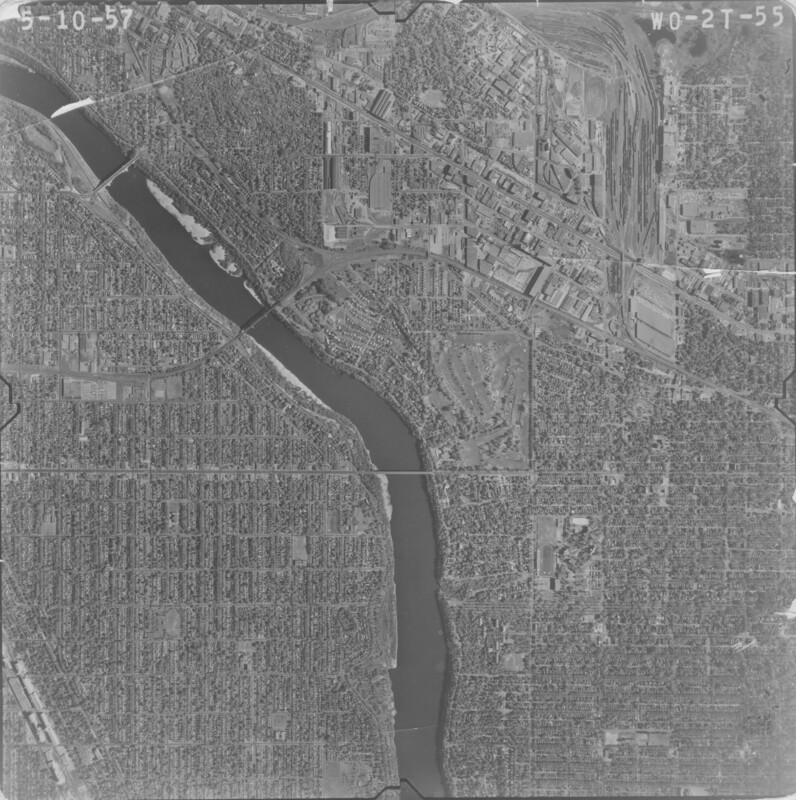 People in Prospect Park have told me that pre-freeway there was a lot more walking across the railroad tracks to get around the neighborhood, including to Saint Paul. But then they put the freeway in, and as in so many places put in a small number of small and poorly sign-posted pedestrian bridges to cross them. The walk along Franklin looks like it would have been OK as recently as 1964 before 280 went in, but the 1964 photo shows the blocks of residential and commercial housing they demolished to make the 94/280 interchange one you can take it great speed. Evan, thanks for the photos, I was looking for these. There was an at-grade RR crossing at Cecil (by Shriners) (at least a desire path, it is hard to see if the road actually went through, though given the continuity of road naming, I suspect it was legal, and it would have been built between 1915 and 1937) that existed with the RRs but disappeared with the freeway which would have improved matters (avoiding about 3 blocks of backtracking in each direction for my particular journey (and many others) if I were to use East River Road). 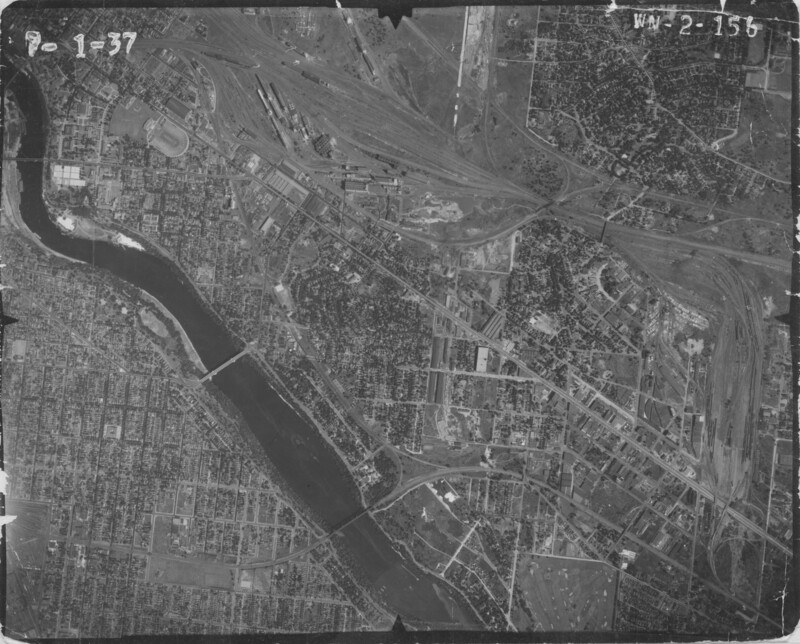 Also, it looks like it used to be much more of a residential area (with some industrial) pre-freeway, and the freeway took out the houses but not the industrial. (i.e. the builders of Mn280, when given the choice of taking houses or industrial, took housing). The amount of space given over to the railroads was just amazing.